Professor Chow is the Chair Professor of Architectural Science and Fire Engineering, and appointed as the Head of Department, Department of Building Services Engineering of The Hong Kong Polytechnic University. He graduated from the University of Hong Kong with a first class honours BSc degree in 1977; and from Portland State University, Portland, Oregon, U.S.A. with a MSc degree in teaching in 1979. 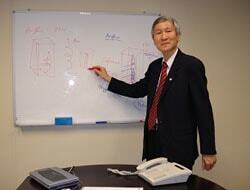 He obtained his PhD degree in Computing Physics from the University of Hong Kong in 1983. Professor Chow joined the Department of Building and Surveying/Building Services Engineering of the former Hong Kong Polytechnic in 1981 as an assistant lecturer, and was promoted to Chair of Building Services Engineering in 1998, retitled as Chair Professor of Architectural Science and Fire Engineering later in that year. Architectural Science, Fire Science and Engineering, and Building Services Engineering.